The Agency for Healthcare Policy and Research (AHCPR), is under the US Department of Health and Human Services. The Agency is charged with writing guidelines dealing with the prevention or treatment of various disease states that threaten the US population. Guidelines that have been written include diabetes, stroke, high blood pressure, and pressure ulcers. There are 6 monographs written on pressure ulcers. The Clinical Practice Guideline (AHCPR Publication #94-0075) presents recommendations with brief supporting information, tables and figures, and pertinent references. The Quick Reference Guide for Clinicians is a distilled version of the Clinical Practice Guideline, with summary points for ready reference on a day-to-day basis. The Consumer Version, available in English and Spanish, is an information booklet for the general public to increase patient knowledge and involvement in health care decision making. The Guidelines can be obtained by calling 202-512-1800. The AHCPR Guidelines for Pressure Ulcers have become the basis used for the prevention and treatment of pressure ulcers in most health care facilities. These Guidelines are frequently the standard by which facility protocols are measured for appropriate patient treatment. A method of pressure management. Air cylinders are inflated and deflated in an A-B-A-B pattern; at a given moment, the A's are relatively inflated and the B's relatively deflated, then an attached pump automatically switches the inflation/deflation of the cylinders so that A's are relatively deflated and B's are relatively inflated. Pertaining to the study of obesity. Co-Morbid factors commonly present in obese patients, including cardiovascular disease, high blood pressure, elevated cholesterol, and coronary artery disease. Braden Scale is an assessment tool for determining a patient’s risk level for incurring skin breakdown. It has been tested in acute care and long-term-care settings, and demonstrates high interrater reliability. Validity has been established by expert opinion, and predictive validity has been studied in several acute care settings with good sensitivity and specificity demonstrated. The AHCPR Guidelines recommend the use of either the Braden or the Norton Scales. Connect to www.bradenscale.com for a copy of the scale, scoring, and suggested interventions depending on the resulting score. A method of equalizing pressure over the surface of the body by means of interconnected air-filled tubes that shift air from tubes under more pressure to tubes under less pressure. This allows greater immersion of the body into the mattress, which decreases pressures under any single point, and distributes pressures over as great an area as possible. A silicone oil that is FDA approved for use as both a protectant and emollient. Its skin-adherent and water repellant properties protect the skin by forming a barrier to soap and water and to water-soluble irritants. An exclusive feature of selected Span-America products in which a tough but flexible wipe-clean coating is fused to the product's foam surface. The coating permanently protects the foam from moisture and air, the two factors that decrease the effective lifespan of foam products. Unlike painted-on or sprayed-on coatings that make foam hard and heavy, the Durafilm coating is ultra-lightweight and has very little effect on the feel of the products to which it is applied. A Group 2 Medicare code that is commonly referred to, as it contains all powered mattresses with the exception of air fluidized therapy. PressureGuard APM, APM2, Safety Supreme and Easy Air are all in the EO277 code. Click here for Medicare's Medical Policy on this code. One of the Group 2 Medicare reimbursement codes for mattresses that are commonly used to assist in the treatment of pressure ulcers. EO373 is a description of "An advanced, non-powered pressure reducing Mattress". The PressureGuard CFT is one of a select few included in this code. Click here for more information on Medicare's Medical Policy for this code. Fatty substances that, when applied to the skin, penetrate below the surface layers to increase skin elasticity, rendering the skin soft and pliable. Emollients in Selan include Dimethicone (silicone), cetyl alcohol, glycerol monostearate, and lanolin. The fee schedule lists amounts, floors, and ceilings for all procedure codes subject to the DMEPOS (Durable Medical Equipment, Prosthetics/Orthotics, and Supplies) fee schedule payment methodology. In addition, this file provides the DMEPOS payment category, jurisdiction, and short description assigned to each procedure code. Medicare carriers and fiscal intermediaries use the DMEPOS fee schedule to price Medicare DMEPOS claims. Hcfa.gov/stats/pufiles.htm/ DME00_B.EXE. The NFPA (National Fire Protection Association) Life Safety Code is a comprehensive document that "addresses those construction, protection, and occupancy features necessary to minimize danger to life from fire, including smoke, fumes, or panic. Among many other things, this code requires newly constructed and renovated hospitals to be protected by automatic sprinkler systems. JCAHO and HCFA both utilize the requirements of NFPA 101, Life Safety Code for determining compliance. For facilities that are not deemed "fully sprinklered" by the appropriate local authority, beginning in January 1998, the 1997 code and the JCAHO requirement apply to newly acquired mattresses, in both new and older facilities. To be in compliance, mattresses must meet the requirements of fire code ASTM E1590 and California Technical Bulletin 129 (CAL 129), or CAL 133 for wheelchair cushions. This is a stricter flammability requirement than "Cal 117", the often-cited minimal standard for foam products used in long term care residences and hospitals. Generally, successfully passing ASTM E1590 and CAL 129 or 133 requires the addition of a fire-barrier fabric inner sleeve around the mattress or cushion. 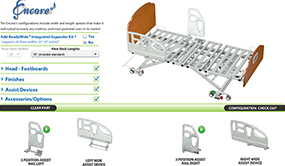 Span-America offers versions equipped with such a sleeve for all models of Span-America Geo-Mattress and PressureGuard mattress models, as well as for all models of Isch-Dish, Gel-T and Geo-Matt seat cushions. A unique support surface design in which computer-guided equipment is used to cut foam into a geometric pattern of supportive cubes that are undercut with an open channel. Unlike flat or convoluted ("eggcrate") foam, these individual cubes allow the surface to conform to the body and accommodate bony prominences. This minimizes the pulling of the skin and tissue both directly across and adjacent to the bony prominence, thereby offsetting the harmful effects of shearing forces. The resulting channel helps to disperse heat and moisture away from the body and out into the atmosphere. The channel also assists in pressure management by providing, in effect, a layer of air between two layers of foam to enhance conformance of the foam to the body. The Geo-Matt design was truly revolutionary when introduced in the first Geo-Matt overlay 1980's. Until that time, most overlays were simple convoluted foam, which offered patient comfort but very little therapeutic benefit. Based on its clinical efficacy as an overlay surface, Span-America has gone on to incorporate the design into the surface of many of its mattress, seat cushions, and patient positioning products. One of the three groups of mattresses designated by Medicare. Group 1 is divided into 11 codes, and contains powered and non-powered overlays, and non-powered mattresses. The patient must meet certain criteria to qualify for any products in this group. Group 1 is generally considered the "prevention" group, as these products are mainly used for prevention of, or early intervention for, pressure ulcers. Foam mattresses are in code EO184. Click here for patient criteria and product choices. Click here for links to Medicare Policies and fee schedules regarding support surfaces. The second of three groups of mattresses designated by Medicare. Group 2 is divided into 5 codes, and contains powered mattresses (EO277 includes low-air-loss, alternating pressure and lateral rotation), and a very small group of non-powered overlays and mattresses (EO373). The patient must meet certain criteria to qualify for any products in this group, including having been on a Group 1 mattress for 30 days with no signs of improvement in the pressure ulcer(s). Group 2 is generally considered the "treatment" group, as these products are mainly used for the treatment of pressure ulcers. The third of three groups of mattresses as designated by Medicare. Group 3 contains the air-fluidized products. Defined negative changes in the body that occur with extended bedrest. These include decreased oxygen uptake, loss of bone mass, loss of skin integrity, loss of appetite, decreased cardiovascular functioning, An excellent article is "The Hazards of Immobility", published in the America Journal of Nursing (AJN) April, 1967, Vol 67, No. 4. A feature of a mattress where the foot end of the mattress slopes down, relieving pressure on the heels. In independent clinical studies, this method has been shown to decrease interface pressure on the heels an average of 27% below interface pressures on heels generated on flat foam surfaces. (Studies available from Span-America upon request). Click here for more information on the Heel Slope. Hospital Bed Safety Workgroup – a The HBSW was formed in 1999 by the FDA (see: www.fda.gov/cdrh/beds ) in partnership with representatives from the medical bed industry, national healthcare organizations, ECRI, patient advocacy groups, and other governmental agencies including the U.S. Centers for Medicare & Medicaid Services, Consumer Product Safety Commission, and Veterans Administration and the Medical Devices Bureau of Health Canada. The group has focused on raising awareness of the entrapment hazard and educating caregivers and family members on the problems associated with bedrail use. For further information about the HBSW Bed System Entrapment Assessment Kit and to access the RFP, visit www.ecri.org/bedsafety . Questions may be directed via e-mail to bedsafety@ecri.org. Agents that help the skin retain its natural moisture, keeping the skin soft and preventing tissue damage. Sorbitol is the humectant in Selan products. Indentation Load Deflection, or Indentation Force Deflection - The measure of the stiffness of open-cell foam. Measured as the number of pounds needed to indent a 4" x 12" x 12" sample of the foam with a 50 square inch circular plate a certain distance. 25% ILD/IFD - indents the foam 25% of the way through the sample, or 1". A measure of conformability or ability to immerse the patient to distribute weight. 65% ILD/IFD - indents the foam 65% of the way through the sample, or 2.5". A measure of the compressibility (called the "65% ILD or IFD"). Also can be considered the measure of compressability or the ability to support the patient and prevent bottoming out. Target number for overlays = 30-40#. Target for mattresses = 30-50# (material at the base can be stiffer than material at the patient surface). Seat cushions sometimes use foams with values higher than 50. Sinking the body into a material (foam, air bladders, etc) to evenly disperse pressure over the entire weight-bearing surface. Too much immersion into a surface will cause "bottoming out", and too little immersion will cause increased pressure on bony prominences that can lead to pressure ulcers. Therefore, the ability of a surface to immerse a patient must be balanced with it's ability to support a patient from bottoming out. The two small prominences at the bottom of the pelvis that sustain the greatest pressures in sitting on flat surfaces. The ischials are a frequent site of skin breakdown in patients who are sitting-dependent, e.g., wheelchair users. A method of pressure management with support surfaces that can be programmed to rotate the patient up to 40° in either direction from flat supine. Lateral rotation (a.k.a. adjuvant therapy, rotation therapy) was originally developed in the late 1980's to attempt to prevent respiratory involvement in the ICU/CCC patient, or the patient on extended bedrest. Since its introduction into the market, lateral rotation has been used increasingly for the management of skin. Indications for this method of pressure management include prevention or healing of breakdown in patients at high risk due to their ability to maintain only one or two positions. Additionally, lateral rotation has been used for patients who cannot tolerate manual handling to be turned due to pain. These patients would include those with arthritis, hip fractures or replacements and skin conditions causing pain with contact. Lateral rotation does NOT replace manual turning to reposition if the patient can tolerate it. Repositioning is meant to change the relationship of the body surface to the support surface, not to horizontal. If the mattress is rotated to 30°, then the patient should be positioned 20-30° from the surface of the mattress, not from horizontal. This gives the skin a chance to fully re-perfuse, to "breathe", to ventilate sweat and heat. Repositioning also shifts weightbearing points. Span-America manufactures PressureGuard APM2 which provides lateral rotation. The PressureGuard APM² can be changed from alternating pressure to lateral rotation with the flip of a switch, but cannot be programmed. Its rotation is fixed to 10-minute cycles. One technology of powered mattresses. Used to decrease excessive body heat and sweat from the patient's body surface. Low-Air-Loss (LAL) mattresses are made of a motor and pump for inflation, and a single or multiple air bladders that comprise the mattress part of the system. The air bladders are designed to purge air, usually through laser-made holes in the surface of the bladders. Some products purge air through the link between the tubing and the motor, or through the material that the bladders are made of. The air goes into the space between the cylinders and the mattress cover. Heat and moisture vapor from the patient diffuse through the mattress cover and into the cover/cylinder space, and is moved away from the patient through air flow. As the patient immerses into the mattress, the pump detects changing pressures and inflation levels in the cylinder(s) and replaces that air via the pump and tubing to prevent the patient from "bottoming out". They are in the Group 2 category of mattresses under Medicare. Click here to learn about the unique Easy Air technology. To soften by wetting or soaking. In the context of skin breakdown, it refers to degenerative changes and disintegration of skin when it has been kept too moist. Skin softened by maceration is more susceptible to the effects of pressure, shear, and friction. If measurement is between 4.25" - 5", choose Small pocket. 5" - 5.75", choose Medium pocket. 5.75" - 6.75", choose Large pocket. For measurements on borderline, choose larger pocket if user is female or big-boned male. Click here for printable version. An active ingredient, proven effective against superficial fungal infections. The ratio of the 65% ILD to the 25% ILD; balances the immersion capabilities with the support capabilities of the foam. The National Pressure Ulcer Advisory Panel is an independent, not-for-profit organization dedicated to the prevention and management of pressure ulcers. Formed in 1987, the NPUAP is comprised of two groups: 1) leading authorities, representing various healthcare disciplines, including medicine, nursing, research, and education, and 2) a sponsoring group of corporations that share the ideals of the NPUAP. The NPUAP sponsors regular conferences, has educational materials available, and has been on the forefront of pressure ulcer documentation, including defining the stages of pressure ulcers and designing the PUSH tool for documenting the healing of pressure ulcers. Refers to convoluted or "eggcrate" foam. "Peak" is defined as the distance between the bottom surface and the top of the points of foam. "Base" is defined as the distance (or, the thickness) from the bottom surface to the lowest point in the valley between two peaks of foam. A base height of at least 2" is recommended for patient care. The re-distribution of pressure off of bony prominences and points of pressure concentration. This can include products that give a more equal distribution of pressure such as foam mattresses, those that change form as the patient moves such as the PressureGuard CFT, or those that are powered to change air volume under the patient such as the PressureGuard APM² (alternating air) or the PressureGuard EasyAir (low-air-loss). A method of determining interface pressures, or the pressures between the skin and a support surface, whether mattress or chair seat. Mapping refers to the use of devices that measure interface pressures over large areas simultaneously. The devices consist of 1) a seat-sized to mattress-sized pad composed of dozens to hundreds of small sensors, 2) a data processor and computer, 3) display and supportive software. Mapping is generally considered to be superior to single-site interface pressure readings, because mapping indicates the distribution of pressure over a larger surface. Single-site interface pressures can be done with relatively inexpensive single cell meters; cells are generally about 2" in diameter. Click here for a short discussion of this term. The layering of various stiffnesses of foam to take advantage of their best qualities. For mattresses, softer foam is layered on top of stiffer foam, so that the patient can immerse into the top foam while the bottom foam supports the patient from bottoming out. In seating, the same principle is applied, so that the stiffer foams can add to longevity of the product while the softer foams are more tissue-friendly. Mattress design feature in which the height of the mattress at its side edges is greater than the height at its center, usually by about 2 inches. The raised perimeter is designed to serve three purposes: 1) to help guide the patient back toward the center of the mattress and away from dangerous position near the edge of the bed; 2) to cradle patients who are at-risk for wandering (eg: dementia), helping to keep them from exiting or attempting to exit the bed without required assistance; and 3) to fill in the space between the siderails and the mattress edge to prevent body parts from becoming trapped and injured. The ability of foam to recover from compression. Increased resilience yields a foam with a greater lifespan. Long-term-care facilities must follow federal regulations regarding the reduction of usage of restraints. *From Guidance to Surveyors, Regulation 483.13(a). The tunnel of air at the base of each cube of foam in the Geo-Matt cut. The tunnel, or ring, helps to transport heat and moisture away from the body, and assists in the conformance of the foam to the body for pressure dispersion. In effect, the Ring-of-Air in the foam creates a foam/air /foam layered product. Click here for more information on the Geo-Matt. Triangular-shaped bone at the base of the spine, between the crests of the pelvis. 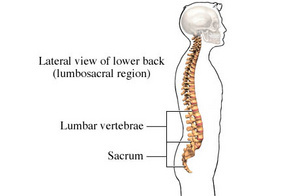 The Sacrum is between the lower back and the "tailbone" or coccyx. Because the sacrum has little muscle or fat tissue protecting it, and takes excessive loads during supine lying and slouched sitting, the sacrum is the area of the body with the highest incidence of pressure ulcers. Mechanical force that acts on the skin in a direction parallel to the body's surface. Shear is the result of two forces pulling the skin in opposite directions: the support surface pulls the skin in one direction while the underlying bone pulls the skin in the opposite direction. The classic example of this occurs on the sacrum as the patient is put into the Fowler's position with the head of the bed elevated. Patients will slide down toward the foot end of the bed, and cause shearing of the skin over the sacrum as it is dragged across the support surface. A pliable, elastic sleeve of thin urethane that is fitted to the Geo-Matt overlay or wheelchair cushions to protect them from moisture. An observable pressure related alteration of intact skin whose indicators as compared to the adjacent or opposite area on the body may include changes in one or more of the following: skin temperature (warmth or coolness), tissue consistency (firm or boggy feel) and/or sensation (pain, itching). The ulcer appears as a defined area of persistent redness in lightly pigmented skin, whereas in darker skin tones, the ulcer may appear with persistent red, blue, or purple hues. Partial-thickness skin loss involving epidermis or dermis, or both. The ulcer is superficial and presents clinically as an abrasion, blister, or shallow crater. Full-thickness skin loss involving damage or necrosis of subcutaneous tissue, which may extend down to but not through underlying fascia. The ulcer presents clinically as a deep crater with or without undermining of adjacent tissue. Full-thickness skin loss with extensive destruction, tissue necrosis, or damage to muscle bone or supporting structures (such as tendon, joint capsule). The ability of a mattress to hold the patient up off the frame of the bed or springs and prevent "bottoming out". Too much support will cause excessive pressures on bony prominences and prevent immersion of the body into the surface. Support must be balanced with immersion, so that a patient has pressure dispersed across the weight-bearing surface without bottoming out. A bony prominence on the femur, or thigh bone, that can be felt at the top of the side of the thigh. The trochanter has a lateral surface (on the side), a posterior surface (on the back surface of the thigh), and an anterior (front) surface. The lateral surface of the trochanter is implicated in a large percentage of pressure ulcers, as patients are placed in a 90-degree or fetal sidelying position. In this position, the lateral trochanter becomes a major weight-bearing prominence, and causes pressure ulcers on the skin overlying the bone. Because of the prevalence of pressure ulcers on this prominence, the AHCPR Guidelines advocate using a 30-degree sidelying position; that is, placing the patient in a position such that the plane of the patient's back or front is 30-degrees from the surface of the bed. Sometimes called "T-foam", "memory foam", or "temperature sensitive foam". Refers to foam that has more of a fluid-like base, sometimes referred to as a fluid with shape and memory. "Visco" foam has a very slow rate of flow. The stiffness of visco foam changes with temperature. As it is warmed, for example by body temperature, it softens, and conforms to the shape placed upon it. The effectiveness of Visco is highly dependent on its density. Zinc Oxide is classified as an astringent. Astringents, when topically applied, form a film on the epidermal layers of the skin and do not penetrate to the deeper layers of the skin. This action forms a barrier that prohibits harsh environmental conditions from reaching deeper layers of the skin. This allows the skin's natural healing processes to be more effective.